I know we’ve just driven to Austin, but I would like to bring you back to Houston briefly to tell you about Marshland, which I went to see this week. It is the current installation at the Rice Gallery and it closes at the beginning of December, so I wanted to let Houston locals have at least a month to go and experience it themselves. It was created by Gaia, a Baltimore based street artist and reflects his impressions of the city of Houston based on a visit, lots of book based research and interviews with staff and students at Rice University. I hadn’t read any of the background before entering the installation and was trying to make sense of the buffalo rumps appearing to leave one corner of the gallery, next to what looked like possibly the building in Houston that Enron used to have their offices in and a grey woman looking over her shoulder. Walking further on to the back wall, my companion recognised the Antioch Missionary Baptist church and I recognised more buildings along Houston’s skyline, all represented kind of transparent with a horizon of blue sky and yellow earth running behind them. The buildings are painted in such a perspective to disorient and unbalance me, like getting vertigo. I kept having to look away and look back to see whether it was the art doing it or that we were having dinner later and perhaps I was hungrier than I thought! In the corner diagonally across from the cattle rumps, is a small herd of buffalo entering the room. The third wall depicts beautiful birds flying towards logos which also looked vaguely familiar. In the centre of the space are columns supporting arches, hanging in most of which are portraits of smiling people. I wondered who they were and my companion thought one may be a politician. We then thought they could be the city council and went looking for the just re-elected mayor, Anise Parker, but didn’t recognise her. 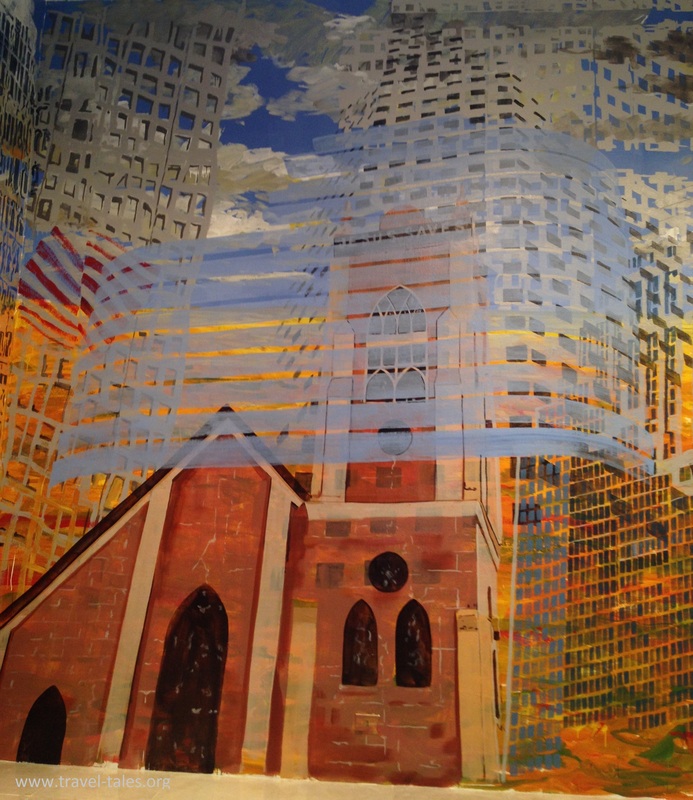 Having now read the blurb that goes with the installation, I think the vertigo of the skyline of the back wall is fully intentional as the artist is depicting how the marshes along the bayou on the gulf coast turned into a small town with a small church which is now dwarfed (although still standing downtown) by the skyline of a prosperous city. The portraits are of the people Gaia interviewed while he was researching and working on the installation. Just for the sensation of standing in a room in which you feel dizzy from looking up at a tall building without ever lifting your head, I recommend a visit. The Rice Gallery is free to visit, open Tuesday – Saturday 11 am to 5pm, Thursday’s late to 7pm and Sunday noon to 5pm. Reblogged this on Lion Surf. Happy new year Tash. Too bad I missed this show. Happy New Year to you too, I hope you managed to get some sleep even if you were locked out of your room most of the night! They rescued us after about an hour.